Though more recent disasters elsewhere have taken the spotlight off of Haiti nearly three years after a massive earthquake rocked the already poverty-stricken Caribbean nation, The Fuller Center for Housing’s work there continues to grow. 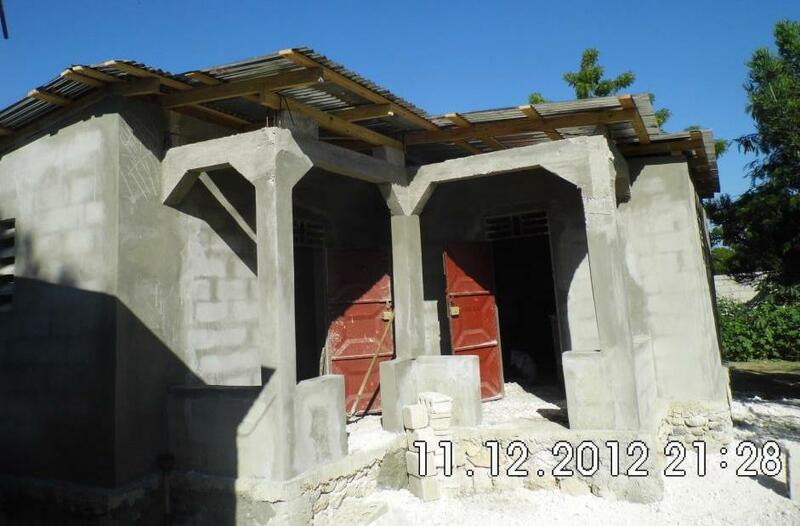 Building in two main areas — near the earthquake’s epicenter in Gressier and the northeast Port-au-Prince suburb of Croix-des-Bouquets — The Fuller Center’s work is easily measurable in one way: A total of 71 new homes have been built, including 47 in 2012. But while the home counts are growing yearly in measurable ways, not as easily quantifiable is the way The Fuller Center is empowering Haitian homeowners, communities and workers. During the past week, however, light has been shed on how both house counts and empowerment are poised for even more growth in the future, particularly in Croix-des-Bouquets. Fuller Center Director of International Field Operations Ryan Iafigliola met at The Fuller Center’s international headquarters in Americus with several people involved in the project — including local resident Jacob Battle, who was in Croix-des-Bouquets last month for the construction and dedication of a Fuller Center triplex that is now home to three families totaling 20 people. Now, Battle wants to see a 100-home village go up in the same area. Battle believes that the cost-efficient homes he has built in conjunction with Fuller Center partner Mike Bonderer (whose Homes from the Heart builds Fuller Center homes in Haiti and El Salvador) meet a need and fill a niche in Haiti. Fuller Center President David Snell also praised the work in Croix-des-Bouquets for carrying on The Fuller Center’s mission of using a hand-up approach focused on long-term results. Snell wanted to make sure that The Fuller Center’s efforts there would be effective and make long-lasting impact as he feared that the flood of handouts pouring into the nation immediately after the quake would ebb and leave Haitians high and dry. When he committed to working in Haiti, he committed for the long haul. 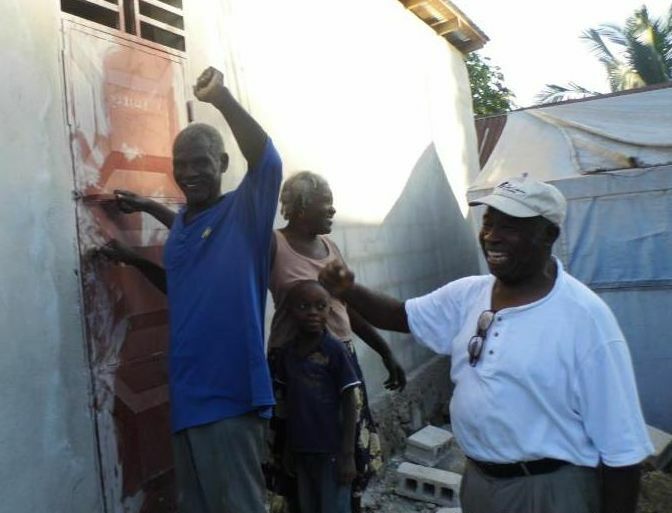 Redeem Dieudonne is better known as “Jimmy” to the people who have worked on the Fuller Center homes in Croix-des-Bouquets. The 31-year-old is the son of a pastor, much like perhaps the most famous person to hail from Croix-des-Bouquets, hip-hop superstar Wyclef Jean. And almost as many people in Croix-des-Bouquets know Dieudonne. And it is that familiarity with the people, businesses and processes of Croix-des-Bouquets that have helped make 2012 such a successful building year there. Dieudonne’s goal, though, is not just to build houses at the best price. He also wants to erase misconceptions about his country and its people. The stereotype some have of Haitians waiting for a handout is another he hopes he can help address by assembling workers to help build the homes. 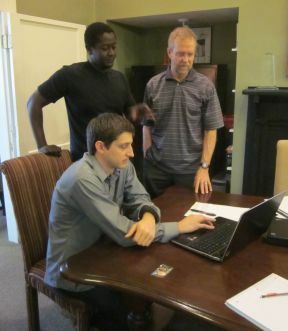 Mark Bradley of CrossWorld also was in Americus to learn more about The Fuller Center’s work in Haiti. Bradley, who has spent much time working in Haiti and is married to a Haitian, is looking for ways his church — Church of the Saviour in Wayne, Pa. — can be more involved in helping people move out of tent cities. He agrees with Dieudonne but also sees how the stereotype has some elements of truth. After talking by phone with Iafigliola and then visiting headquarters in Americus, Bradley came away impressed with The Fuller Center and its method of offering a helpful hand up in partnership with Haitians. “It was a blessing talking to Ryan,” Bradley said. “He’s like a breath of fresh air on this whole subject because it’s been very discouraging to see how many big organizations that are supposed to have big money in Haiti, and it seems like nobody is doing housing. … This is an operation that’s doing good work — and doing it very efficiently. Iafigliola was pleased that Bradley got to see two perspectives of The Fuller Center’s Haiti efforts — from headquarters and from a Croix-des-Bouquets resident. As for Dieudonne, he is eager for the next houses to go up because he sees first-hand how much it means to his neighbors. If you would like to know more about how you can help our work grow in Haiti, contact Fuller Center Director of International Operations Ryan Iafigliola at ryani@fullercenter.org. See photos from The Fuller Center’s work in Croix-des-Bouquets and Gressier. Want to volunteer to work in Haiti? Click here. Click here to donate and change more lives in Haiti.